November 16, 2018. 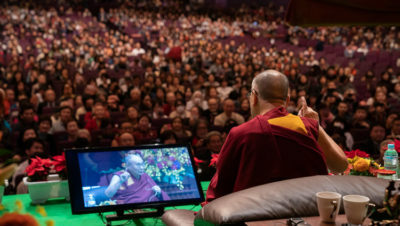 Yokohama, Japan – Immediately after His Holiness the Dalai Lama joined the other panellists on the stage at the National Convention Hall this morning, Ms Youko Yamaguchi welcomed the participants and the 5000 strong audience as she introduced the event. She invited His Holiness to make his opening remarks. “I’ve been engaged in discussions with American, European and Indian scientists such as Richie Davidson and Wolf Singer for many years. Ancient Indian science as embodied in the Nalanda Tradition advocated reasoned investigation particularly with regard to the mind and emotions. During more than 30 years of these talks proponents of modern science and Buddhist science have achieved mutual benefit. Having learned a great deal about the physical world, Buddhist scholars and contemplatives have acquainted modern scientists with qualities of the mind. The Mind & Life Institute that emerged from these interactions continues to organize conferences and workshops. “Secondly, the world is passing through an emotional crisis as reflected in the violence still taking place. During the 20th century there were two world wars, Japan was twice attacked with nuclear weapons and 200 million people lost their lives in violence. If this had resulted in a better world, it might have been justified, but violence necessarily means suffering. Since there are still people who believe that problems can be most efficiently solved by use of force, there’s a risk of repeating the errors of the 20th century. Therefore, we must endeavour to make this 21st century an era of peace. “We need to educate people about how the use of violence is out of date. Peace in the world won’t be achieved unless people develop inner peace. The goal of a demilitarized world will not be achieved until individuals start to implement inner disarmament. These days, there’s evidence that constant anger and hostility are bad for our health. Scientists, whose influence is widespread, have a role to play in popular education. Japanese neuroscientist Dr Iriki Atsushi opened his presentation with the statement that he wanted to know what a human being is and what is its relation to the rest of the world. He distinguished between plants and animals by pointing out that the latter have nervous systems that are used to process information. He observed that sense organs tend to be at the front, towards the top of the head—where the brain is. He discussed studying monkeys in his laboratory. They, like human beings, can be trained to use tools with results that demonstrate how adaptable the brain can be. It treats the tool as an extension of the hand, much as binoculars and so forth are extensions of the eyes. As little as two weeks training in using tools can be shown to result in changes in the monkeys’ brains. Dr Iriki compared this to changes that take place as a consequence of evolution, which, because they take place over much longer stretches of time, cannot be examined in the laboratory. His Holiness asserted that he also believes in evolution, but what he considers important is to enquire about mind and consciousness. Until late in the 20th century scientists dismissed any talk of mind being anything other than a product of the brain. Now there are experts like Richie Davidson who accept that there is something other than the brain that can affect the brain. His Holiness introduced the phenomenon of people, mostly accomplished meditators, whose bodies remain fresh for some days after clinical death. Their hearts stop, circulation ceases, their brains are dead, and yet their bodies remain poised and fresh. Scientists have, as yet, no explanation for this observable occurrence, but a project has been set up to look into it. Buddhist science explains it as a result of the remaining presence of the subtlest consciousness. Once that departs the body slumps. His Holiness mentioned that different levels of consciousness can be identified. He pointed out that when someone undertakes training in concentration, they do so on the level of mental consciousness, disregarding sensory consciousness. He repeated his belief in evolution, that to begin with there was empty space within which energy, heat, fluidity and solidity emerged evolving until there were conditions to support consciousness. Dr Chong-Sun Chu, a quantum physicist from Taiwan told the panel that he wanted to know how the universe works. What he has learned is that the world is beautiful and it is understandable. He observed that it is remarkable that the laws of physics appear to hold true despite vast variations of scale. However, on a subatomic level the world behaves differently as described by quantum physics. It is a world of waves and particles. He touched on the uncertainty principle, entanglement, which he illustrated with an example of the relations between round and square cakes, string theory and quantum geometry. Psychologist Dr Yoshiko Sakiko of Kyoto University introduced a young researcher, Fujino, who had met His Holiness and after a vipassana meditation course was inspired to do research into meditation and the brain. He has been investigating whether differences can be identified in the brains of people undertaking two different forms of meditation. These are shamatha, which is described as focused attention meditation (FAM) and usually involves the development of concentration and vipassana, which is described as open monitoring meditation (OMM). Focussed attention meditation is conducted by focussing on the breath, whereas open monitoring meditation involves being aware of present existence as it is. The brains of the 17 meditators involved in the investigation were scanned by MRI after periods of meditation. Their striatums were analysed which revealed increased selective attention in those doing FAM and decreased selective attention in those doing OMM. Further research is being done related to memory and re-experience of emotion. His Holiness clarified that he prefers to compare placement or concentrative meditation and analytical meditation. Part of the practice of analytical meditation in relation to the cultivation of positive emotions like compassion would involve learning about what compassion is and how to cultivate before entering into meditation. When first person experience is examined by a third person it is crucial, he suggested, that they be unbiased. As to whether it’s possible to be both a meditator and a scientist, His Holiness confirmed that as far as he is concerned Nagarjuna was a classic example of someone who was both. 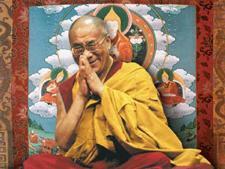 He remarked that there are Tibetans who claim that logic is primarily a tool with which to defeat others. This, he said, is an error. It’s necessary to use logic in your own analysis. Ignorance is removed by employing reasoning and wisdom, not prayer or focussed attention alone. This is relevant because all destructive emotions arise out of ignorance. Answering questions from the audience His Holiness advised that one way to familiarize yourself with the fundamental mind of clear light would be to learn to recognise when you are dreaming. If you can cultivate meditation in the dream state, when the sensory consciousnesses are not functioning, you can access a subtler level of mental consciousness. His Holiness reiterated the need to augment modern education with instruction about inner values and the mind. He recommended that just as students are taught the importance of physical hygiene to health, they should also be instructed in ways to develop emotional hygiene, learning how to tackle destructive emotions as they arise. He went on to encourage the use of human intelligence to strengthen basic human qualities like loving kindness. He stressed the importance of recognising the oneness of humanity. Once again His Holiness waved and saluted the audience, then stood for a few moments hands folded as if in prayer for their well-being before leaving the stage. Tomorrow, he will address a group of Japanese young people on the theme ‘One—We are One Family’ in Hibiya, Tokyo.